FebriDx® is an easy to use point-of-care test, providing primary and secondary care practitioners with an accurate assessment of a patient’s immune response to an acute respiratory infection by simultaneous measurement of myxovirus resistance protein A (MxA) and C-reactive protein (CRP), directly from a finger prick blood sample. 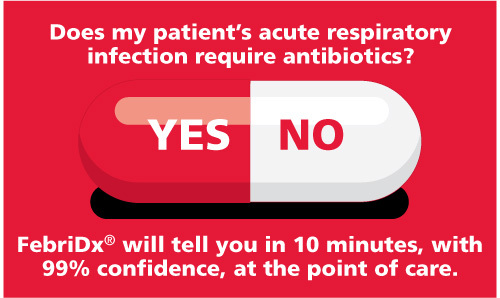 Results are available in 10 minutes and will rule out bacterial infection with 97% – 99% confidence. FebriDx® self-contained, single use test kits are maintenance free and require minimal training. A prospective, multi-centre US clinical trial to determine accuracy of FebriDx point-of-care testing for acute upper respiratory infections with and without a confirmed fever. Outpatient Antibiotic Stewardship: A Growing Frontier—Combining Myxovirus Resistance Protein A With Other Biomarkers to Improve Antibiotic Use. Diagnostic Accuracy of FebriDx: A Rapid test to Detect Immune Responses to Viral and Bacterial Upper Respiratory Infections. FebriDx Point-of-Care Testing to Guide Antibiotic Therapy for Acute Respiratory Tract Infection in UK Primary Care: A Retrospective Outcome Analysis. FebriDx for C-reactive protein and Myxovirus resistance protein A testing in primary care.